Bent workpieces and the associated machine failures are an imminent production risk when grinding very sensitive thin work pieces. To eliminate this risk, grinding is often accomplished in a number of production steps. This requires that the workpieces be removed from the machine repeatedly and recharged after adjustment of the process parameters. DISKUS WERKE SCHLEIFTECHNIK GMBH has developed an efficient process for continuous, through feed plunge-cut (KDE) grinding which facilitates continuous surface processing of both sides even on thin work pieces or materials that are difficult to grind. In technical literature, double-side-face-grinding is also named as Diskus grinding, and has become quite popular as an extremely efficient machining process in the world of grinding. Worldwide this process has become famous for its extremely high cutting rate, particularly in mass production.However, if work pieces are thinner and thinner, the risk of deflection and distortion is rising, ending up in production losses.As alternative method, sending the work piece several times through the machine, have been proven to be possible, but it is also space-consuming and less efficient at the same time. DISKUS WERKE SCHLEIFTECHNIK, one of the pioneers in double-sided surface grinding, introduces the KDE grinding process for such applications. KDE stands for continuous, through-feed-plunge-cut grinding (German: Kontinuierliches Durchlauf Einstechschleifen), a process in which the workpieces are loaded only once, for example, via a stack magazine interface. The workpieces are passing unclamped continuously through the grinding zone, from the loading point to the discharge station. 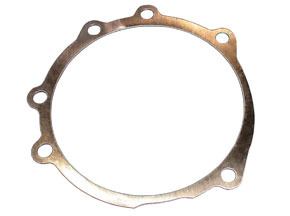 During the process the parts are lying loose in a limited number of pockets of a driven, round transfer disc. 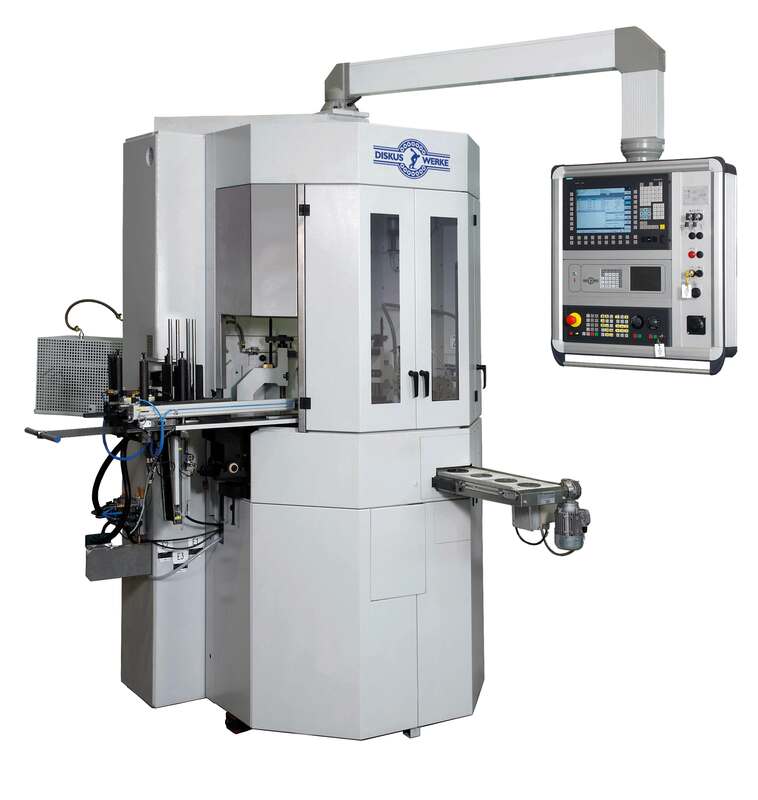 While processing, the workpieces are guided between the faces of the grinding tools mainly. 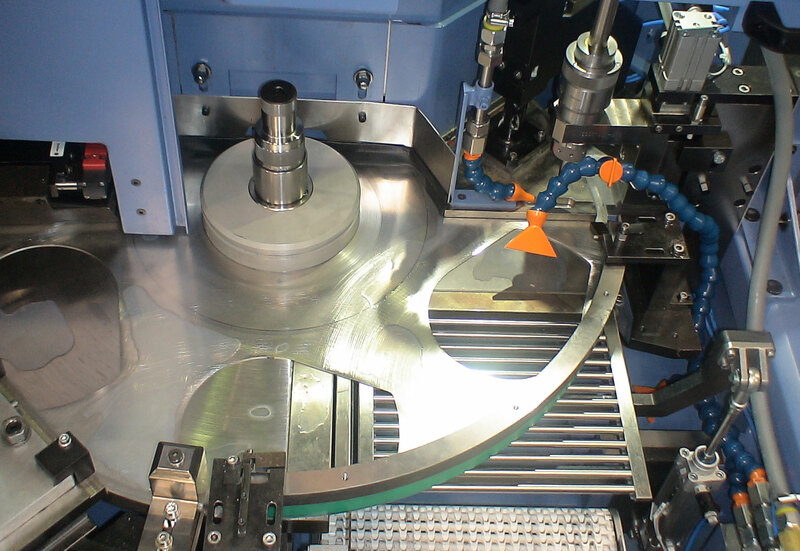 Within several rounds of the feeder disc, the workpieces are ground down to the target pre-dimension. The grinding tool infeed is accomplished continuously until the distance between the grinding tools approaches the final dimension. The final size is controlled by a measuring probe, which measures the thickness of the workpieces after grinding. After reaching the target dimension, the grinding process is ending with a spark out process. Afterwards the workpieces are discharged onto a conveyor belt. Because the grinding zone is always filled during the process, changes in the cutting forces do not occur at the beginning or end of a series, which would influence the part dimension, as a result of changes in the grinding pressure. Controlled discharge of chips and abrasion from the grinding wheels is of great importance for this grinding process. As the tools face one another, flushing of the contact surface is only possible to a limited extent. The transfer disc, which moves the workpieces through the grinding zone, also prevents the grinding wheel rims from being flushed free. As a member of the DVS Group, DISKUS was able to draw on the expertise of the DVS abrasive producer NAXOS-DISKUS SCHLEIFMITTELWERKE. Together, a grinding wheel was developed, where the chip spaces between the abrasive grit pick up the ground material volume of a workpiece and the resulting abrasion from the grinding tools and transport it away from the contact zone. As soon as the workpiece no longer covers the chip space, the chip spaces between the grit are again flushed normally. The KDE process thus allows specific, plane-parallel surface grinding even on very thin and sensitive workpieces with very little tolerances in terms of thickness, flatness and parallelism. Processing of bigstock removal rates are also possible. 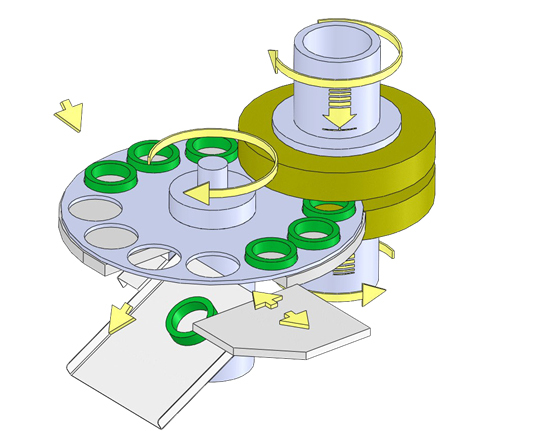 Automatically working down holder plates are also available as an option. The KDE process - a good alternative to fine grinding with lapping kinematics.